FIN*Lumihelmen cattery had been searching a male house cat, suitable for the novice class, already for some time, when an interesting announcement was found on the Apula web pages in February. A red blotched tabby kitten, age five months, was for sale in Kullaa, Finland. 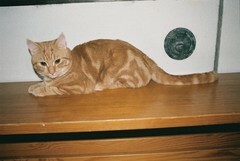 No information was available of his parents but the litter reportedly consisted of several red blotched tabby kittens. After negotiations, a visit to Kullaa and after finding a suitable home for placement, this kitten, now named Sampo joined our cattery. The name is taken from Kalevala, the national epic of Finland, where the blcksmith Joukahainen beats Sampo, a miracle making machine. Our Sampo has a very gentle character and he enjoys human company. Our desire was to find a novice European to bring more genetic variation to the genome pool of our breed. First of all this idea arose from the observation that it was not easy to find non-related studs forour females. We aim at starting FIN*Lumihelmen breeding by using novice studs, or studs genetically comparable to them when compared to the pedigree of the female, for all of our breeding cats. y not in all ways be as good as our breeded Europeans, but he is good enough to be registrated as European. Sampo was thanked for a good type and expression, as well as his strong red colour. Also his coat was considered very springy. However, according to Sneum, Sampo does not necessarily have the temperament of a show cat, but luckily, according to her, it is not demanded from a novice. Furthermore, H.-S. Sneum adviced that one stud should never be used in plenty of matings with many females, but used after careful consideration, again, to avoid problems in the future. We were delighted to get Sampo registrated (EUR d 22). At the end of the cat show Sampo received an award for a new registrated novice from the organizers. This was an encouraging gesture and a happy finale of a successful show day. Our future aim is to use Sampo at least for one of our own females, and other interested breeders are welcome to contact me to discuss possible use of Sampo in their breeding. However, because Sampo has shown some spraying behaviour, it is possible that we cannot maintain him unneutered for a long time. This article has been published in Serry 3/2010 and is presented here by permission of SER-FER.